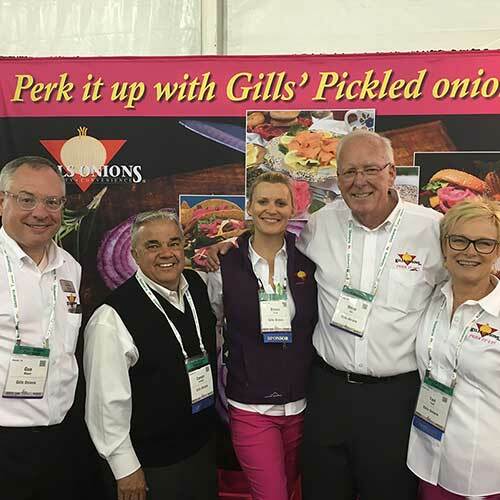 One highlight of the recent PMA Foodservice Show in Monterey, CA, was the introduction of Gills’ Pickled onions, beautiful slices of red onions in a sweet and tangy pickle brine. Its booth packed with customers and other attendees throughout the show, Gills Onions saw excellent reception for the new product that was conceived by company partner Steve Gill – another testament to his ability to read market trends. And while the display included Gills Onions’ standard product lines, the focus was definitely on the new product, with a bright color theme repeated throughout: Pink-red displays in glass jars, fuchsia backdrops and even fuchsia pants for the women working the booth. And there were pickles for sampling. Gills Onions got the memo. Steve Gill told OnionBusiness that the pickling recipe was developed in-house and remains top secret. In anticipating success with the line, Gills is working with culinary professionals to develop recipe options including using the pickled onions as a base. Teri Trost, midwest regional sales manager, said the pickles are extremely versatile, and possibilities are endless. Starting with the known favorites such as fish tacos and sandwiches, they go on to complement nachos and burgers and a huge list of ethnic items. Like most pickles, the slices have a 30-day shelf life and require refrigeration after opening, Teri said. Gills new product adds to well-known and successful processed onion product line that features packaged fresh whole, diced, and sliced onions in all colors.